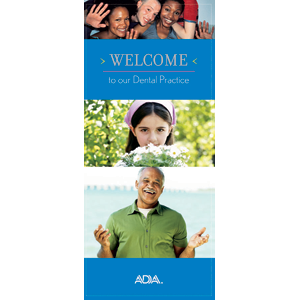 Brochure explains in clear and easy-to-understand language, the process of a dental visit, and the important role the patient plays in informing the dental team of any changes in their health. Reinforces the importance of regular visits in the early detection of problems such as gum disease, tooth decay, and oral cancer. Clear explanation for patients on the importance of sharing health history in order to receive the most complete dental care. Common screenings are covered including gum disease, pre-cancerous changes, and tooth decay. Cosmetic advances in dentistry are briefly covered as well. 6 panels. Minimum order 150. Click Add to Cart then personalize for free. Now you can add personalized information on the front, back, or both covers on all brochures.